Low power public radio station WHIV (102.3 FM) offers New Orleans community activists a human rights and social justice platform through which they unify local and global communities, while challenging corporate media power. WHIV was formed in 2013 by infectious disease physician and medical school professor MarkAlain Dery, in response to federal government programs that allowed for the expansion of “micro-broadcasting” through lower power FM radio stations. Dr. Dery and his wife Liana Elliot recognized the potential to build a community and raise awareness for issues of human rights and social justice, and of local communities that go unnoticed by larger media. WHIV’s founders had no prior experience or training in radio broadcasting, but applied for their LPFM license after Dr. Dery, who was teaching medicine in Cambodia at the time, learned that the FCC would issue 1,000 new radio licenses in the expansion of a federal program. Most of their community activism prior to the formation of WHIV had been focused on their HIV-related non-profit, the New Orleans Society for Infectious Disease Awareness (NOSIDA), and they intended to use their radio station for a similar purpose – to de-stigmatize and draw attention to the HIV issue within American society. Beyond HIV/AIDS, they saw radio broadcasting as a platform for community engagement surrounding all local issues and communities. 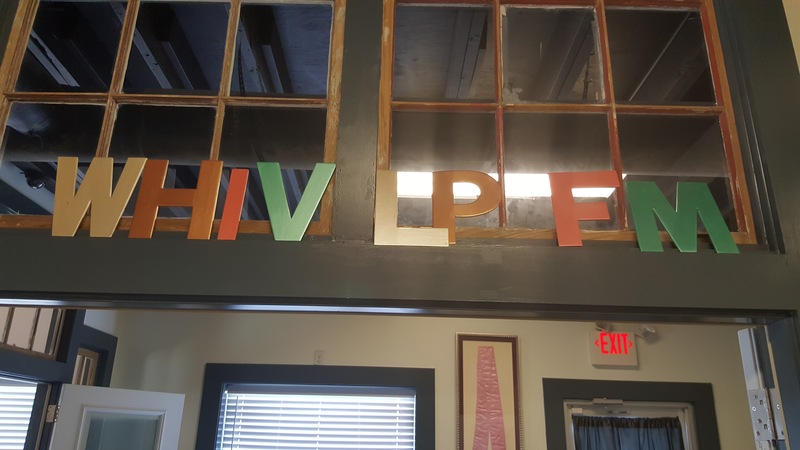 WHIV’s team connected with Bob Dunn, a New Orleans-based advocate for LPFM stations, who advised them for the FCC application and assisted them in navigating the technical issues of engineering and licensing predicate to operating a LPFM station. Dr. Dery chose as his call letters for the new station W-H-I-V to underscore his efforts of bringing attention to the inequitable way that HIV affects communities and particularly harms the disadvantaged, and to promote human rights and social justice. WHIV’s radio location is uniquely situated to avoid interference with commercial radio broadcasters. Issuance of LPFM licenses is limited by federal law to nonprofit groups, religious organizations, Native American tribes and local governments, and LPFM broadcasters tend to be local and community-based organizations. Navigating through federal broadcasting red tape, engineering specifics and local zoning and regulatory hurdles in New Orleans was a daunting exercise for the station’s founders and the federal rules allowed them only 18 months following their winning a license before they had to start operating. Now in its third full year of existence, WHIV operates with a 6-person Board of Directors and over 60 on-air hosts, most of them volunteers. The station provides nearly 15 regular shows featuring music and entertainment programming. All volunteers, including on-air talent, must be trained in the technical aspects of broadcast radio, because most have no prior media experience. Most on-air hosts, have other full-time jobs, for example, and there is currently no full-time station manager. The founders’ vision for the station sought to bring little-talked about issues like AIDS/HIV into broader public awareness, and in the early years of the station they resisted suggestions to change their call letters to something less ominous sounding. Dedication to their causes made Dr. Dery and Liana Elliott eager to publicize their efforts and unafraid of any stigma that might adversely impact listeners’ reactions to their format. The underlying goal behind the formation of WHIV is to offer listeners an “open floor,” and the station’s management wants to honor independent voices for whom they see little room in traditional commercial and terrestrial radio. LPFM operators, and WHIV in particular, represents a different radio type than traditional community radio stations such as NPR. Citizen-activists, both with WHIV and beyond, have used lower power radio stations to contest media power and give a voice to those who are ignored or drowned out by big media or corporate power. Though these local voices have little competitive clout against big media because of the size and financial disparities between the two parties, they possess the ability through LPFM stations to use media as a platform to share stories of diversity, social justice, and human rights and effectively combat the pervasive power of corporate media to dictate message content. In campaigning to federal agencies such as the FCC for the expansion of LPFM broadcast rights, small-scale media activists focused intently on the non-commercialism and potential for localism that is embedded in the LPFM platform. The low power FM format allows community-based radio activists like the operators of WHIV to oppose the commercialism and sameness of large-scale commercial radio. In fact, the operators of WHIV believe that the regulatory mandate for localism in their broadcast operations is met when their stations serve as an alternative to commercial radio. Liana Elliot defined localism from WHIV’s perspective as “the opposite of commercialism,” or a radio format for homegrown “grass roots” people or organizations who otherwise would not have the opportunity or platform to share their messages. In practice, however, WHIV’s radio operations go beyond merely local listeners. WHIV increasingly focuses on web-based content, podcasts, and other expanded platforms that go beyond traditional terrestrial radio and are heard by audiences far away from New Orleans. Despite the community radio legislation that allowed LPFM broadcast licenses’ promotion of localism, the audience of WHIV is in many ways global, and the station founders view their mission to promote localism as any effort they undertake to serve non-commercial voices. LPFM broadcasting offsets the power of corporate media power because it allows community members to create new narratives or contribute to existing ones. WHIV and other organizations of citizen-activists are successful in their efforts to contest media power because they send messages of empowerment that encourage community members to remain engaged, educated, and active participants in their local and global communities. Moreover, the operators of WHIV have made it their goal to give a voice to the local people of New Orleans, and in doing so they contest media power by bringing back power and communicative, or media, spaces to local communities. By focusing on community-based issues and formats, and providing their local constituencies a platform for their social justice and political concerns, LPFM stations provide an alternative for listeners to commercial radio that is increasingly national, increasingly corporate, and rarely reflects local tastes or issues. By addressing both localism and activism, LPFM counters the uniformity and corporate anonymity of commercial radio and media. Platforms such as WHIV promote greater diversity of content, and in fact diversity of purpose, between different LPFM operators in differing markets and increasingly monolithic commercial radio. Through these oppositional distinctions from commercial radio LPFM provide both an opposition and an alternative to the corporate order, and a resource for localism and activism.